The 2013 NFL Combine is now in the books. We will give recaps of the top players at every position. Today we discuss quarterbacks. Unlike most years, this class of quarterbacks is not blowing people away and demanding that one of them will be the top overall pick. In fact, the Kansas City Chiefs traded yesterday for Alex Smith, so it’s clear they will not be taking a quarterback. If there is one word that describes this entire class, it’s inconsistency. There are some very physically gifted quarterbacks in this class, but for the most part this is a class of guys that make you say “Wow!” on one play then the very next play you might say “What was that?”. Mike Glennon is one of those guys. He can throw an absolute laser into tight coverage on one play then bounce the ball five yards in front of a wide open receiver on the next play. What is missing from this class is “wow factor”. One thing is clear; this class doesn’t have an Andrew Luck or RG3 in it and may not even have a Russell Wilson. I’m not saying some of these guys might not end up being good NFL quarterbacks, but I believe that most of them will take some time to be developed and groomed into their spots as a starter. Matt Barkley-USC (6-2 227 lbs. ): Did not work out due to a shoulder injury suffered during the season. Has experience in a pro-style offense. Doesn’t have elite size or arm strength. Sometimes tends to stare down his receiver. At one point he was considered to be a Heisman candidate. He’s probably still a first rounder, but probably will not be the first quarterback taken. Tyler Bray-Tennessee (6-6 232 lbs. ): Has good size and a live arm. Throws a nice deep ball and drives the ball down the field. Good physical tools. Throws a nice spiral with good velocity. Accuracy and footwork are not consistent. At times he trust his arm too much, forcing throws into bad spots. Colby Cameron-Louisiana Tech (6-2 212 lbs. ): Ran a spread attack. Athletic. Good runner (4.78 40). Efficient and highly productive. Smart player that doesn’t make many mistakes. Quick release. Anticipates routes well. Doesn’t have great arm strength, but has nice touch. Mike Glennon-NC State (6-7 225 lbs. ): Tall, but lanky. Needs to add some weight. Huge arm but wildly inconsistent. Height allows him to see downfield. Ran a 4.94 40, but doesn’t have great foot speed. Makes some decisions that really make you scratch your head. Needs to read defenses better and anticipate his receivers better. Marqueis Gray-Minnesota (6-3 240 lbs. ): Good leadership and a total team player. Going into the Combine he was slated to move to tight end, but after his Combine workout, teams may be interested in keeping him at QB. Very coachable and will do whatever it takes to win. As a senior he played quarterback, running back and wide receiver. Ran a 4.73 40 and 4.30 in the short shuttle. Runs well and has good athleticism. Was very accurate in his workout and put the ball where receivers could run after the catch. Landry Jones-Oklahoma (6-4 225 lbs. ): Not extremely athletic. Ran a 5.11 40. Good pocket passer, but gets rattled when pressure is put in his face. Doesn’t throw extremely well on the run. Sometimes struggled in big games. Deep passes looked better than his intermediate passes. Didn’t do much at the Combine to move himself up the rankings. Collin Klein-Kansas State (6-5 226 lbs. ): Refused to work out as a tight end, insisting to work as a QB. Has a funky throwing motion. Very little zip and lots of air under his throws. Ran a 4.78 40. Powerful lower body. Patient, determined runner that can break tackles. Has the athleticism to play at the next level, but I don’t think it was be as a quarterback. EJ Manuel-Florida State (6-5 237 lbs. ): Big and strong. Able to pull the ball down, take on defenders and move the chains. Looked very smooth. Fluid passing motion. Ran 4.65 40 (#2 for QB’s). Good arm that can stretch the field. Quick release. Footwork is inconsistent which can affect his accuracy. Sometimes forces throws. MVP of Senior Bowl. Very solid Combine workout. Intriguing prospect that is moving up draft boards. Ryan Nassib-Syracuse (6-2 227 lbs. ): Is rising up draft boards. Coaches love his football IQ. Gritty player that doesn’t have elite physical tools. Arm looked better than expected. Quick release. Throws a pretty fade pass. Puts a lot of air under deep passes. Doesn’t have elite size. 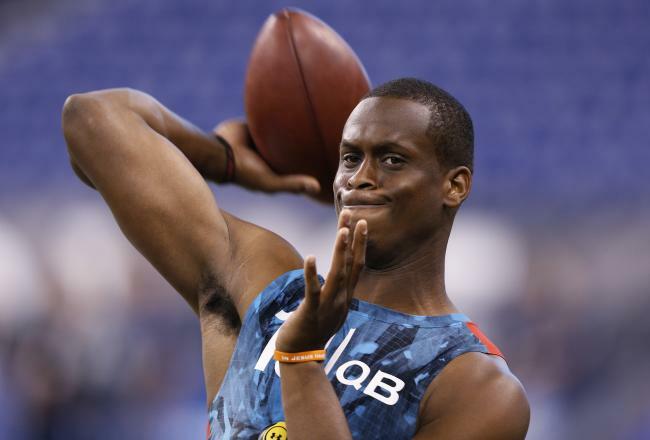 Geno Smith-West Virginia (6-2 218 lbs. ): Had a good workout. Likely the first QB to be taken, but will not be #1 overall. Gym rat that lives in the film room. Highly competitive, does not like to lose. Ball comes out of his hand naturally. Good arm strength and throws a really nice deep ball. Has nice touch on the ball. Has good athleticism but looks to throw the ball first and only runs if necessary. Good accuracy. If he misses, it tends to be high because his feet were not set. Able to go through his progressions to find the open receiver. 4.59 40 (#1 for QB). 33.5 vertical jump (#2 QB). 10’ 4” broad jump (#1 QB). Tyler Wilson-Arkansas (6-2 215 lbs. ): Very raw. Great physical tools. Impressive arm strength. Played better as a junior than as a senior. Had a tough senior year and he took a beating which led to a change in his delivery. Sometimes trusts his arm too much and forces the ball into coverage. Struggled with accuracy on his shorter throws. I was highly pleased to discover this web-site.I wanted to thanks for your time for this splendid read!! I undoubtedly enjoying each and every little bit of it and I have you bookmarked to take a look at new stuff you weblog post. This entry was posted on February 28, 2013 by draftmaniacs in All-Star Games and Combine, Scouting reports and tagged 2013 NFL Combine, 2013 NFL Draft, 2013 NFLDraft, E.J. Manuel, Florida State football, Geno Smith, Matt Barkley, Mike Glennon, NFL, NFL Draft, USC football.